This cake is a mouthful, quite literally. 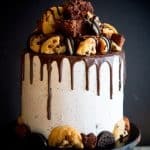 Layers of chocolate and white cake are separated by brownie bits, Oreos, chocolate chip cookies, whipped vanilla buttercream, as well as chocolate buttercream! With the mixer on low, slowly add in confectioners sugar , milk, and salt; frequently scrape sides and bottom of the bowl. Store in refrigerator up to 2 weeks.